An aviation book about a man and his Piper Cub airplane, tells tales of adventure, flying cross-country in a restored tail-dragger. 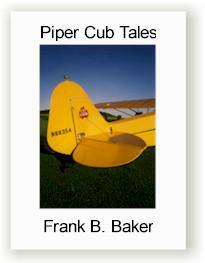 Book includes a chapter on Piper Cub restoration for vintage aircraft enthusiasts. Raised during the Golden Age of Aviation, author Frank B. Baker is skilled aviator with more than 3,000 pilot hours in his J-3 Cub. A published author in several fields, his dry wit is sure to entertain. "Piper Cub Tales" is a firsthand account of flying low and slow, across much of America's most magnificent countryside in a 1946 Piper J-3 Cub. In the fall of 1969, with the ink on the Author's Private Pilot's Certificate hardly dry, he and his brother embarked on a cross-country trip from Madison, Wisconsin to Denver Colorado in his newly restored Cub. This flight, captured in this book, introduces you to the vagaries of the weather and the difficulty of navigating at low level using only a map, a compass, and airspeed. It also reveals the capabilities of this lightweight, low powered airplane. Even though the Cub's 12-gallon fuel tank restricts its range to around 100 miles per flight leg you will see how long distance flights are accomplished. As you follow the Cub's progress across the countryside, it will become apparent that staying on course depends upon recognizing: contours of the land, creeks, radio towers, roads, and railroad tracks. This is classical "seat of the pants " flying. The many facets of this flight provides you with the basic framework underlying the many cross-country flights flown over the past nearly four decades that are presented in this aviation book. In this book, you can fly cross-country with Frank and the Cub. With Madison as the starting point, the flight paths of these trips have taken the Cub across the Appalachian and Great Smokey Mountains of the east. Over the prairies of South Dakota, Nebraska, Wyoming, and Colorado where the Cub seems to flow in unison with the undulating landscape. He and his daughter flew the Cub over the seemingly endless deserts of Arizona and then east across the Rocky Mountains at Denver. 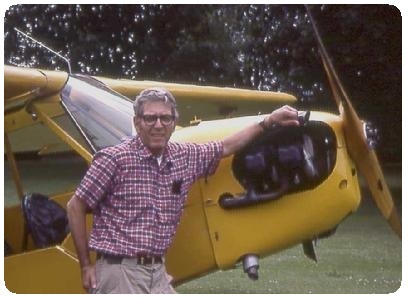 He and his pal, the late Bernie Neuman flew the Cub to Seattle, Washington going over four mountain passes and on the return trip went through the Columbia Gorge at low altitude. On these flights many adventures (some routine, some harrowing) were had, these include: flying in atrocious weather, landing in farmer's fields, fighting high winds, and coping with density altitude in 100 degree temperatures. None the less the Cub came through all of these with ease. Flying a Piper Cub cross-country the way the author, and many others like him do, represents a type of flying that is slowly disappearing from the aviation scene. Through this book, you, the reader, will be able to sense the uniqueness of flying cross-country in a Piper Cub and feel that you were a participant in the adventures. "For over 35 years, Cub Club member, Frank Baker, has been flying his stock 65 hp Cub all over the U.S. with a single 12 gallon fuselage tank. Frank has had many unique and interesting experiences. A good read for all Cub lovers." "This book is an amazing story about a man in love with flying and the J3 Cub. A must read for anyone that is interested in this wonderful plane." The author grew up during the "Golden Age of Aviation" and WWII and always has been participant in things aeronautical. He is a well-known designer of radio control model airplanes. He has published numerous magazine construction articles for such models, specializing in multi-engine WWII bombers. In 2015, the national Academy of Model Aeronautics inducted Frank into the Model Aviation Hall of Fame. During the Korean War, he was a navigator in B-26's flying day and night weather reconnaissance as well as night photo missions out of K-14 air base near Seoul, Korea. In 1969 he restored a badly damaged Piper Cub to like new condition. He received his Private Pilot Certificate in the same year. Since then he has accumulated over 3,000 hours of flying time in this Cub. Much of this time has been acquired on long cross-country flights to distant parts of the United States, totaling some 71,695 miles. Routes, such as to Denver and Lock Haven, PA, have been flown many times. He also has considerable experience in mountain flying. In parallel with being a Piper Cub pilot, the author has been a University professor and researcher in the field of psychometric theory and has published a number of books in this area. He is a long time member of EAA, the Cub Club, and of the Midwest Antique Airplane Club. Cover photo of Piper Cub tail section was taken at Lodi, Wisconsin.